NFL and Nike: Are protests hurting the game's ratings? Dubbed "hard to watch" by US President Donald Trump, the TV ratings for this year's NFL season kickoff have reportedly dropped by 8%. This comes after Nike's decision to make Colin Kaepernick, the first NFL player to kneel during the national anthem, the face of its new campaign. Some people have linked the controversy surrounding NFL protests to its falling viewership, including Donald Trump. But others argue lower ratings indicate a wider shift away from TV. 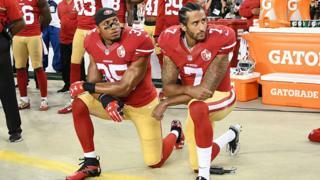 The US president has been vocal about his criticism of Kaepernick and other players kneeling in the past. On Sunday he tweeted: "Wow, NFL first game ratings are way down over an already really bad last year comparison. "If the players stood proudly for our flag and anthem, and it is all shown on broadcast, maybe ratings could come back?" This was just hours before Colin tweeted his appreciation to NFL players Kenny Stills and Albert Wilson for kneeling during the US national anthem on Sunday. Are people turning away from the NFL? While Trump's tweets suggest people are losing interest in the NFL due to players protesting, former NFL player Osi Umenyiora says interest in the NFL is just as high as ever. "That's going nowhere," he told Newsbeat. "The quality of the game, the quality of the product is too good, it has nothing to do with the taking the knee protest. "People just aren't watching TV anymore." He added that access to the internet, phones and mobile devices means "people are switching off from television in general, not just the NFL". "Viewing figures are down across all sports, viewing figures are down across pretty much every single thing on television right now so to blame that on the taking the knee protests is fake news actually." Attendance figures don't appear to be as poor as some critics have suggested either. The average attendance during the NFL season was 69,264 per game in 2017 and 68,914 per game in 2016, according to Business Insider UK. But Thursday's kickoff game, which was played by the Atlanta Falcons and Philadelphia Eagles, amassed a total of 69,696, placing it well within the average attendance figures for an NFL game. Former NFL player Jason Bell attributes this to the fact "people always come back to the game". "They can't wait until the NFL season is upon us and once the clock goes off people are excited to watch it again," he told Newsbeat. The NFL's figures aren't the only numbers under scrutiny. Following the announcement from Nike that Colin Kaepernick would feature in its new campaign, critics took to burning Nike products in protest. Many people shared their disapproval online using the hashtag #BoycottNike, along with #JustBurnIt. Despite the backlash, Nike sales have reportedly increased by 31% in the period after the advert's release. In the same way the Nike controversy doesn't seem to have hurt its sales, Jason and Osi say it won't overshadow the game. "From the early stages people might be talking about what Nike's done, which I think is a tremendous thing," Osi said. "But I think as the season goes on the game always triumphs. "In the NFL you see the things that happen, the teams, it's a soap opera playing out there on the football field. "I think at the end of the day that's going to overcome everything."